Firstly I have to say that this is very easy to learn if you have a patient teacher but I think would be a bit of a struggle for two uninitiated players. There aren’t really any complex rules but there are a lot of interlocking abilities and some odd rule interactions. Secondly it’s really, really good fun. The reason it’s so fun is that your heroic dudes and ladies don’t keel over like puny mortals because they aren’t puny mortals! Even the weakest of characters can sustain at least one solid hit before potentially fading into unconsciousness but they are super heroes so there’s a reasonable chance they’ll get back up later! 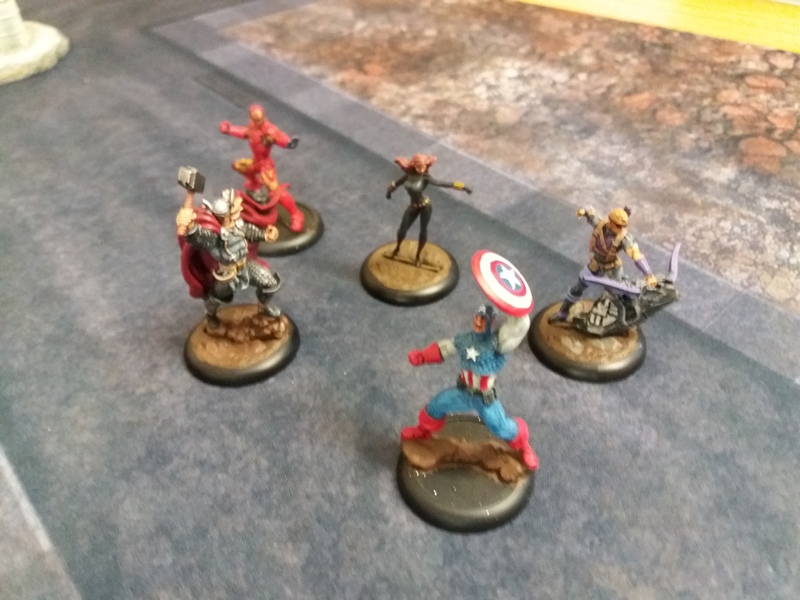 Each team has it’s own strengths and weaknesses, so the Avengers are very good at picking on a weak enemy and concentrating fire on one guy especially because they’re so quick! Thor, Iron Man and Captain America all zoom around the place like it’s going out of fashion generally avoiding anyone dangerous and mugging the less so. The X-Men seem to have pretty good synergy across the board, especially beyond the starter set but even just running Deadpool and Wolverine is pretty nasty since they both regenerate every turn, lots of hurling things (including each other) around fun to be had here too. 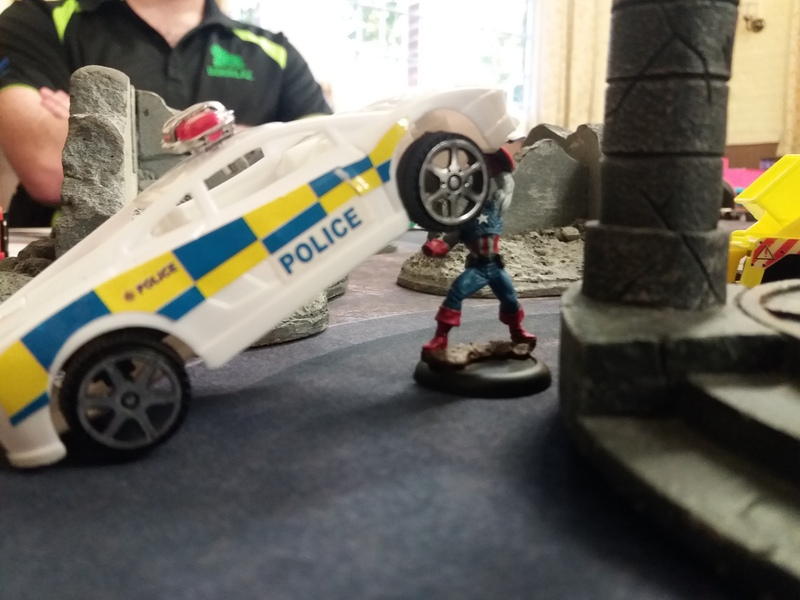 The Guardians of the Galaxy really gel as a team; the first game we played I split them up against the Avengers and watched as the speedy (and not overly heroically behaving) crew took down my crew one piece at a time, highlight of the game porbably when Captain America blocked an entire Police car being hurled across the road at him with his shiny shield and possibly Rocket sniping Hawkeye because y’know why not! Advised to have them stick together so Groot and Drax can bodyguard them all and Gamora gets better mileage from her abilities, things went much better against the X-Men. A great deal of luck helped here as Groot repeatedly body guarded the others whilst Rocket and Starlord finished Rogue and the Drax/Gamora freight train ran over Wolverine who found himself isolated. 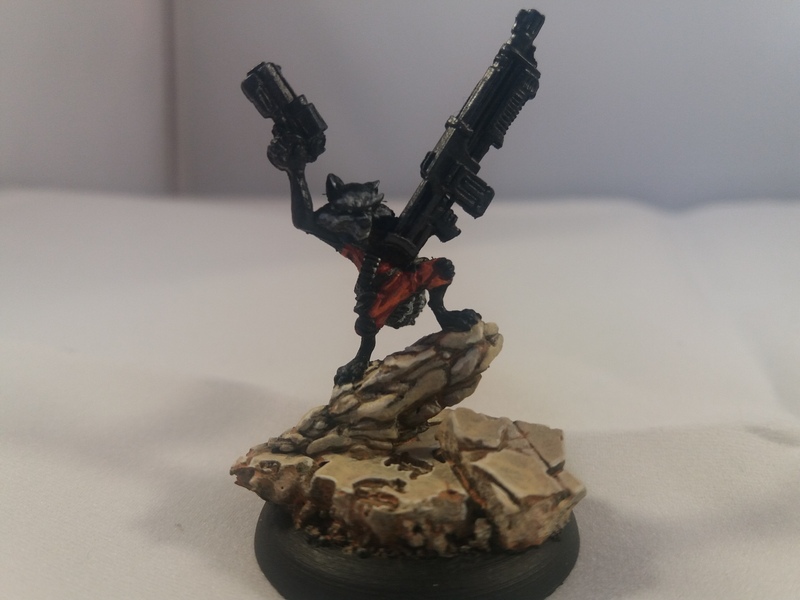 Even Rockets Heavy Plasma Rifle scored a direct hit on a badly wounded Cyclops to end his day. My thoughts on the game? It’s not the most well balanced affair, with relatively small points scores for characters it’s always difficult to find the right balance but there does seem to be a large skills gap between characters of the same level. There are lots of skill rules and synergy to be aware of but chances are you’re a fan of either the comic books or the movies so you’ll know what your guys are capable of broadly speaking. 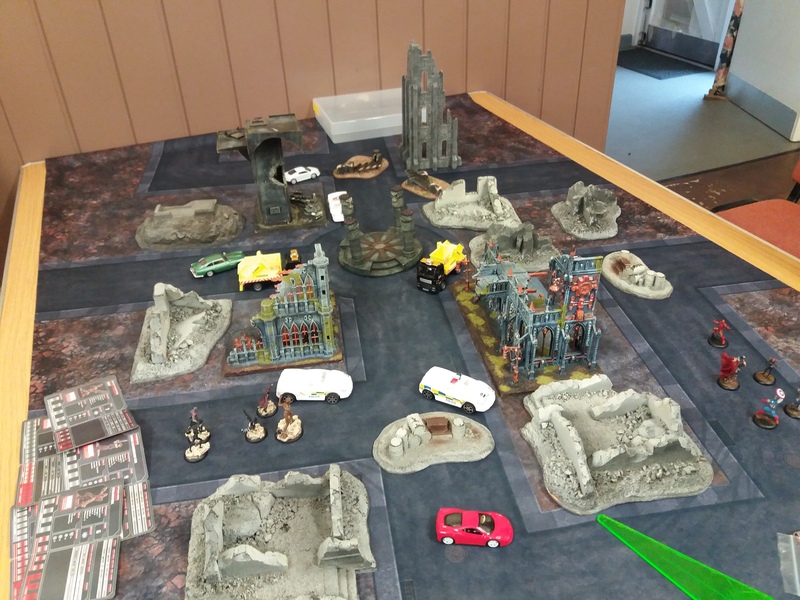 As such it plays very well and even as a beginner I quickly got to grips with trying to get the most out of the rules.